Sam Spinner and Supasundae are two fancied contenders for the 2018 Sun Bets Stayers' Hurdle, which takes place at the Cheltenham Festival on March 15, but while that pair are destined for the Grade 1 staying showpiece at Prestbury Park, of the 38 horses entered a whole host of them could be seen elsewhere during the four-day National Hunt extravaganza, and that certainly makes it tough for ante-post backers. We take an in-depth look at the 2018 Stayers' Hurdle, which was won last year by the Willie Mullins-trained Nichols Canyon, and this year's contenders will attempt to etch their names alongside some of the greats of the game. Jedd O'Keeffe's SAM SPINNER has been hugely progressive this season, as having chased home Court Minstrel in the Silver Trophy Handicap Hurdle at Chepstow, the six-year-old then went on to trounce a quality field in a competitive Haydock contest by 17 lengths, and then rocketed into Grade 1 company by landing the Long Walk Hurdle in style at Ascot. Now a best-priced 9/2 favourite with Betfair Sportsbook, Sam Spinner has suddenly become awfully short in such a wide open division, and having never tested himself on the undulations of Cheltenham, and having mainly blossomed in rain-softened ground this season. then he could be worth taking on at the prices. Yes, he is a fast-improving horse, and could continue on an upward curve, but there's reasons to not get excited about the 9/2 on offer, and Jessica Harrington's second favourite SUPASUNDAE certainly makes more appeal at the head of the betting for several reasons. A 13/2 chance with Betfair, Supasundae will be attempting to follow up last year's final two-length victory in the Coral Cup, and while he has yet to get his head in front again, he has chased home Apple's Jade in his last two starts in Grade 1 company this season, with his second in the Ryanair Hurdle in December a real fine effort. APPLE'S JADE is entered here, and is 10/1 with William Hill, but she is set to try and retain her Mares' Hurdle crown on the opening day of the Cheltenham Festival, so punters looking to back that one are much wiser to back with a firm that are Non Runner No Bet (NRNB), but then she is as short as 3/1 with Betfred, who are NRNB on this market. Mullins trained the ill-fated Nichols Canyon to victory in this race 12 months ago, and he will send last year's Albert Bartlett Novices' Hurdle hero PENHILL to the Stayers' Hurdle, and is possibly one of the more solid each-way bets at 10/1 with William Hill for this prize, but he is yet to be seen this season, although Mullins expects him to be ready for a return to the Cheltenham Festival. L'AMI SERGE (12/1 with Ladbrokes) and FINIAN'S OSCAR (12/1) with Coral) have both had similar campaigns, with both being switched from hurdles to fences, and back again, and the former was last seen placing in the Sky Bet Chase, while the latter was pulled up in the Cleeve Hurdle, and is set for a wind operation, so both need to be ignored at this stage. A total of 38 entries have been made for the Sun Bets Stayers' Hurdle at the Cheltenham Festival. Nigel Twiston-Davies will unleash an intriguing team in this year's Stayers' Hurdle, and it's THE NEW ONE that has to be our first port of call from the Naunton yard, as he aims for glory in this race having been a regular in the Champion Hurdle in recent times. Forever the bridesmaid in the Champion (beaten four times), The New One is 14/1 with William Hill to land this prize, but while he still continues to blossom over hurdles in the latter part of his career, as he showed when winning the Champion Hurdle trial at Haydock Park, this is a whole different test over three miles, and it's certainly WHOLESTONE that makes more appeal from Twiston-Davies' yard at 16/1 with Betfair Sportsbook, as he was just beaten by Agrapart in the Cleeve Hurdle on Trials Day, and was previously impressive when winning the Relkeel Hurdle at Cheltenham, but he will need a deluge of the wet stuff to play a hand here. UNOWHATIMEANHARRY was sent off odds-on favourite for this race 12 months ago, but Harry Fry's charge was well beaten by Sam Spinner last time out, and looks to lack the ability he once showed, and is worth avoiding at 16/1, as our the likes of FAUGHEEN and LA BAGUE AU ROI, who are set to line up in the Champion Hurdle and Mares' Hurdle, respectively. BACARDYS (16/1), BEER GOGGLES (25/1), LIL ROCKERFELLER (25/1) are a trio of runners that could take their place, and the former of that trio has to make the most appeal, but Willie Mullins last placed that runner over fences, however, has stated that he is set to return to the hurdling sphere, and is worth a second look. The 2018 renewal brings back memories of the 2013 race which saw Solwhit land victory, as it was a year after the dominance of Big Buck's had ended, and a whole host of runners lined up with a real chance, with Oscar Whisky heading the betting, and this year's Stayers' Hurdle has a feel that a huge-priced runner could challenge for victory. A real eye-catching entry is DIAKALI, who is a best-priced 50/1 shot with William Hill. A previous inmate of Willie Mullins, he has since moved to Gary Moore's yard, and Moore has stated that this is a hopeful entry for a horse that was fourth in the 2013 Triumph Hurdle, and fourth in the 2014 County Hurdle, while under Mullins' stewardship. 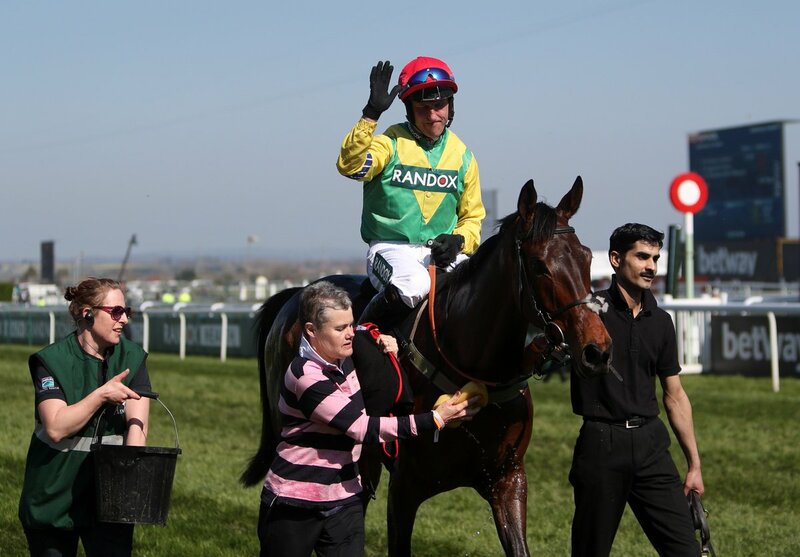 However, he was last seen cruising to a facile win at Fairyhouse last April, and Moore has his eye on the National Spirit Hurdle at Fontwell Park next month, and if he can run well there then that could be a stepping stone to this race, and for those tentative punters then the 40/1 with Paddy Power (NRNB) is the way to go. Of the other potential lively outsiders, BARTERS HILL (33/1) is a class act on his day, and could figure, if lining up, while COLIN'S SISTER (33/1) and BALLYOPTIC (50/1) are another brace of entries in what should be a helter-skelter betting market in the next six weeks.